The Hillsboro “marching mothers” who fought for integration of Hillsboro elementary schools in the 1950s are among the new inductees this year into the Highland County Hall of Fame. The founder of the newspaper today known as The Times-Gazette is among this year’s inductees into the Highland County Hall of Fame. Moses Carothers will be inducted under the heading of “Enterpise,” along with Judge Richard Davis (Leadership), the late Edwin B. Ayres (Enterprise), Helen B. Hoover (Arts and Entertainment) and Wesley T. Roush (Leadership). In addition, the Lincoln Mothers will be recognized as a group during the ceremony. The Highland County Historical Society created the Highland County Hall of Fame to recognize, honor and celebrate those who have made invaluable contributions to the county and/or the world beyond. By honoring and recognizing these people, the Hall of Fame serves to stimulate an interest in – and appreciation for – the value of the history of this county and its citizens. Further, the Hall reinforces to our youth that they can, and should, strive for excellence in any endeavor they may undertake. The ceremony will be held at the First Presbyterian Church at 2 p.m. on May 27, with a reception and social hour immediately following at the Highland House Museum. The Highland County Historical Society invites the public to attend. The five to be inducted expands the number of those enshrined to 56. A total of 20 people have been inducted for Leadership, 17 for Arts and Entertainment, 14 for Enterprise, and five for Sports. Moses Carothers (1792-1843) founded the first newspaper in Highland County, the Hillsborough Gazette, 200 years ago this year. On the 19th of June in 1818, Carothers published his first edition. The Hillsborough Gazette was the first newspaper printed in southern Ohio outside of Cincinnati and Chillicothe. Edwin Billingham Ayres (1891-1964) was a longtime pharmacist and civic leader who owned and operated Ayres Drug Store in uptown Hillsboro. The business was known as one of the oldest continuous drug stores in the state of Ohio. He was also a standout track star at Hillsboro High School and at the 1909 state meet, he won gold medals in the high jump and pole vault and a silver medal in the broad jump. In 1957, he was the first member elected to the Hillsboro High School Athletic Hall of Fame. Judge Richard L. Davis, a civic leader in Highland County, practiced general law for four years, and then was elected Prosecuting Attorney for Highland County for 12 years. He served as Common Pleas Court Judge, Juvenile and Probate Divisions of Highland County for 30 years. He also served as a visiting judge in many counties after he retired. He was a member of the Ohio State University basketball team that won the Big Ten Championship in 1944. He is currently retired and living with his wife, Kathryn, in Hillsboro. Helen Blackburn Hoover (1910-1984) was an author and metallurgist. She graduated from McClain High School in 1927 and earned a degree in chemistry at Ohio University. She married Adrian Hoover in 1936. During World War II, when Adrian was in the military, she studied at the University of Chicago, where she earned a degree in metallurgy. Known as a wilderness writer, she authored seven books, including three children’s books. Several were printed in Readers Digest. Wesley T. Roush (1910-2006) spent more than four decades as an educator and administrator in Highland County, mostly as a longtime principal at Washington Elementary School in Hillsboro. He graduated from Hillsboro High School in 1928, earned his bachelor’s degree in 1932 from Miami University, and received his master’s degree in education and administration in 1940 from Ohio State University. He started teaching in a one-room schoolhouse during the early 1930s and later taught and was an administrator for Hillsboro City Schools. As principal, he was known as a positive influence on countless number of students who came through Hillsboro City Schools. The Lincoln Mothers were a group of African-American mothers who fought for school integration in 1954 in Hillsboro. For two years, the mothers and their children marched every day, despite segregationist redistricting, cross burnings and legal threats. 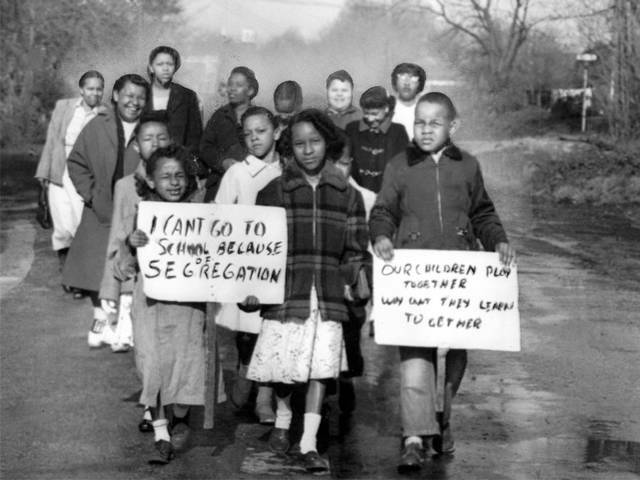 Their lawsuit against the school board was the first northern test case of the historic Brown v. Board of Education decision of 1954, which had declared school segregation illegal. The efforts of these mothers helped not only end segregation in Hillsboro, but their efforts and sacrifice ended segregation in other northern cities. For more information on the Highland County Historical Society or the upcoming Hall of Fame ceremony, call 937-393-3392 or email the society at hchistoricalsociety@gmail.com. Information for this article was supplied by Steve Roush, vice chairman of the Highland County Historical Society Board of Trustees. https://www.timesgazette.com/wp-content/uploads/sites/33/2018/04/web1_Lincoln-School-marching-kids-pic.jpgThe Hillsboro “marching mothers” who fought for integration of Hillsboro elementary schools in the 1950s are among the new inductees this year into the Highland County Hall of Fame.